Announces plans to leverage Ele.me’s on-demand platform to pilot delivery services in Beijing and Shanghai in September 2018; delivery program to expand across 30 cities to more than 2,000 stores by end of 2018. Partners with Hema supermarkets to create “Starbucks Delivery Kitchens” specifically designed for Starbucks delivery order fulfillment, further expanding delivery capabilities while ensuring the highest levels of the third-place in-store customer experience. Companies to co-create an unprecedented virtual Starbucks store that will integrate multiple platforms across Starbucks and the Alibaba ecosystems, to enable a seamless and even more personalized experience for members to register, redeem benefits and enjoy an extensive range of services. Starbucks Coffee Company (“Starbucks”) (NASDAQ: SBUX) and Alibaba Group Holding Ltd. (“Alibaba”) (NYSE: BABA) today announced a deep, strategic “New Retail” partnership that will enable a seamless Starbucks Experience and transform the coffee industry in China. Collaborating across key businesses within the Alibaba ecosystem, including Ele.me, Hema, Tmall, Taobao and Alipay, Starbucks announced plans to pilot delivery services beginning September 2018, establish “Starbucks Delivery Kitchens” for delivery order fulfillment and integrate multiple platforms to co-create an unprecedented virtual Starbucks store – an unparalleled and even more personalized online Starbucks Experience for Chinese customers. In addition, Starbucks will partner with Hema supermarkets to be the first retail brand to establish dedicated “Starbucks Delivery Kitchens” within their locations. The “Starbucks Delivery Kitchens” will utilize Hema’s distinct fulfillment and delivery capabilities to complement the delivery of handcrafted Starbucks coffee and tea beverages offered through existing Starbucks stores. 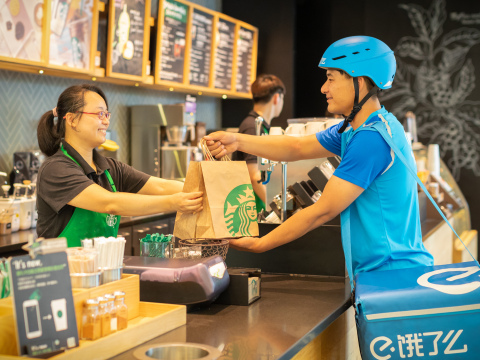 Starbucks will also leverage Hema’s highly effective consumer insights and unique fulfillment expertise to further penetrate and better serve the needs of individuals and families in communities across China. This latest innovation will revolutionize the traditional offline-to-online model by effectively extending the reach of the Starbucks Experience into the everyday lifestyle ritual of the Chinese consumer, regardless of time or place. Whether it is at home or in the office, within a Starbucks store or online, Starbucks customers will be able to access and enjoy a one-stop Starbucks Experience when purchasing merchandise online, buying a Starbucks handcrafted beverage to be delivered to a friend or sending a Starbucks gift of love on the “Say it with Starbucks” social gifting platform. Starbucks will progressively integrate its Starbucks Rewards (SR) membership platform onto the centralized system to leverage its consumer insights to deliver a truly personalized experience to its customers, while establishing a strong foundation for the future development of Starbucks digital experiences in China. Starbucks and Alibaba are trusted business partners who share common values in the spirit of innovation and the unrelenting pursuit of product and service excellence. This deepened partnership is a significant step as both companies partner together to elevate the customer experience across China.